Every city has areas that have acquired the reputation for being a ‘trouble spot’. Sometimes this comes about through an increase in the numbers of crimes occurring, or perhaps it’s the result of bad road design so that an intersection becomes an accident black spot. Sometimes it’s because an area isn’t terribly lovely to look at: perhaps the architecture is uninspiring or dull, or perhaps the area gets filled with unlovely things like litter, debris, waste bins, and the like. Perhaps it’s an area that people tend to walk through without seeming to engage with the space – most cities have area which lead into major transport hubs, with crowds flowing in and out of train stations, around tram or bus stops, down major roads, and so on. And sometimes you get an area that combines all of the above. When that happens, the site is often seen as a real ‘problem’ area. One of these problem sites exists in the centre of Melbourne: an area covering a couple of blocks around the intersection of Flinders Street and Elizabeth Street. The City of Melbourne is canvassing opinion about the area, from residents, traders, commuters and so on, and one might expect that a council would simply carry out a letter box survey and then have a few committee meetings with relevant stakeholders to work out what should be done. Well, all of that may well be going on, but what’s exciting is that the City of Melbourne has also chosen to make one of its Arts and Participation Programs engage with this area. The result is an urban intervention that certainly has the potential to generate interesting information for the council’s deliberations, but which also constitutes urban art in itself. The City of Melbourne commissioned a group of artists, led by Jason Maling, Sarah Rodigari and Jess Olivieri, in order to find ‘an alternative method for Council to engage with the city night experience and explore diverse experiences and views. The artistic outcomes aim to provide a counterpoint to late night culture, and is designed to activate the space with positivity, romance and humour and to create a softer alternative to an area that is quickly gaining a reputation for the inverse’. The result is an arts project called the League of Resonance. [We] seek out the intangible and barely perceptible. We detect vibrations that form the backdrop to the mythical narrative of daily life. We situate ourselves in places of intrigue, we listen, we talk, we connect and we hum. In collecting and combining the resonance of individuals: their stories, perceptions and rituals, we unravel the backdrop to this myth. Together we create a new sound. This sound is The League of Resonance. So what does this all mean? I met two of the League’s founder members, Jason and Jess, and went on a ‘date’ with them to discover the work of the League and to share stories with them about this particular segment of urban space. We met outside the photo booth at Flinders Street station, on the south side of the intersection of Flinders and Elizabeth Streets. Jason and Less explained how the project aimed to take seriously the idea of an area having a ‘bad vibe’ and their desire to investigate all the components of this area’s vibe, to discover where its current vibrations come from. These investigations have been historical, aesthetic, architectural, sociological and ethnographic: they have uncovered information about the precinct’s origins, the buildings that used to be there and have been demolished. They have walked and walked around the area, in different weathers and at different times of the day, trying to pay attention to everything. They have documented the businesses in the area, and have spoken with commuters, residents, the local council, Victoria Police, employees and employers, punters, and students. They have photographed the area and its buildings, and have created a dossier of information about individuals who meet with them and agree to join the League. (League members also receive membership cards.) They produce an occasional newsletter setting out tiny snippets of information and ideas about the area, and have developed a program of ‘good works’, from suggestions by interviewees as to what actions would help people in the area. These have included holding the hand of very drunk people, and assisting people to cross the road at this traffic accident black spot. Much of these activities and ideas are inspired by the conversations generated when League founders meet with individuals on a ‘date’: which means having a cup of tea or coffee in one of the precinct’s cafés, and walking around the streets and laneways of the area, sharing stories. On my ‘date’ with Jason and Jess, I learned about the tram stop that is being used as an informal shoe exchange (people seem to leave unwanted pairs of shoes in the tram stop which are then used by the homeless) and the embankment that overflows with rats at night. On a walk that involved many moments of delight, there were two highlights for me. The first involved a panorama. Several floors up, we gazed at what initially looked like a spread of unremarkable modern office buildings. But as Jess and Jason pointed out details of the buildings and told stories about each, the buildings revealed themselves in their singularity: a tall narrow building topped by a private swimming pool, an opulent bank, a backpackers’ hostel, a building used as a depository for pornographic magazines and books. Knowing even these small details about the buildings started to attach histories and emotion to these spaces, making me realise that even the most bland and anonymous buildings are always the products of specific desires and functions, some of which conflict with each other, and all of which participate in the resonance of a neighbourhood. 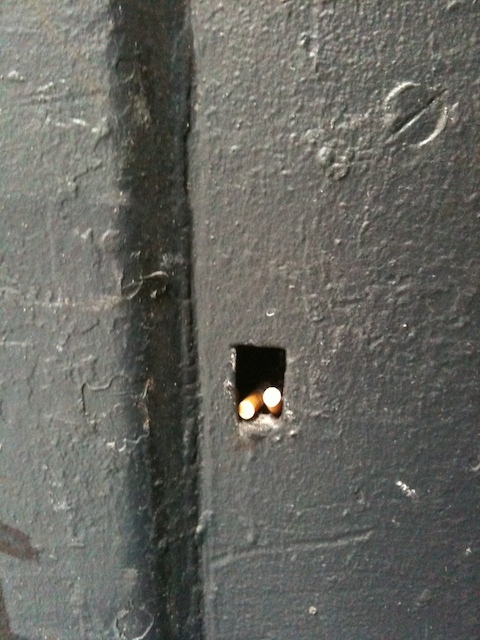 Two butts are inserted into a tiny space in the wall; others are carefully lined up on a narrow shelf. Granted, they are cigarette butts and thus not terribly lovely to look at, and of course they are environmentally problematic in many ways: they are litter, and you could say that they should be in a bin. But something about their placement arrested me: they hadn’t just been dropped and stamped out on the ground. Instead, they had been inserted or balanced in unexpected places, almost in ways that responded aesthetically to their surroundings. 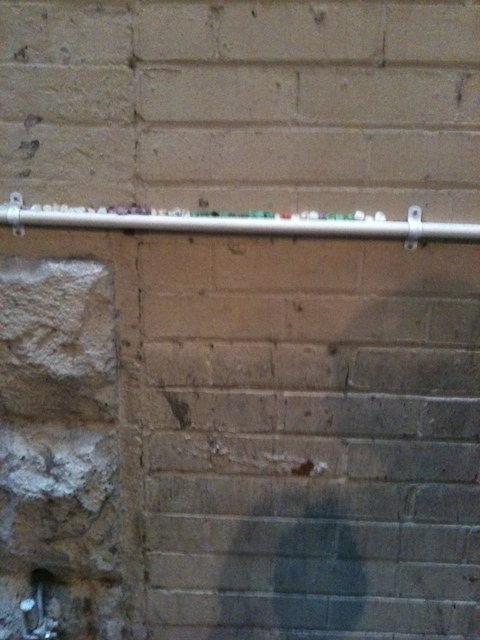 It is a line of chewing gum wads, placed along a ledge on one of the wooden hoardings. 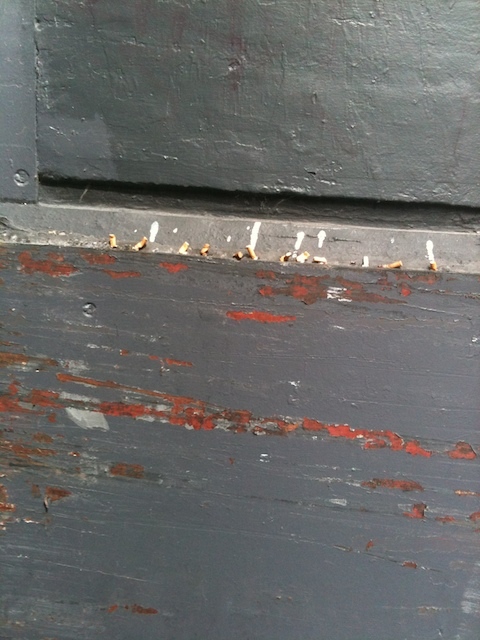 It is litter too, of course, just as the carefully placed cigarette butts are. But, like them, its placement indicates something in addition to standard littering. 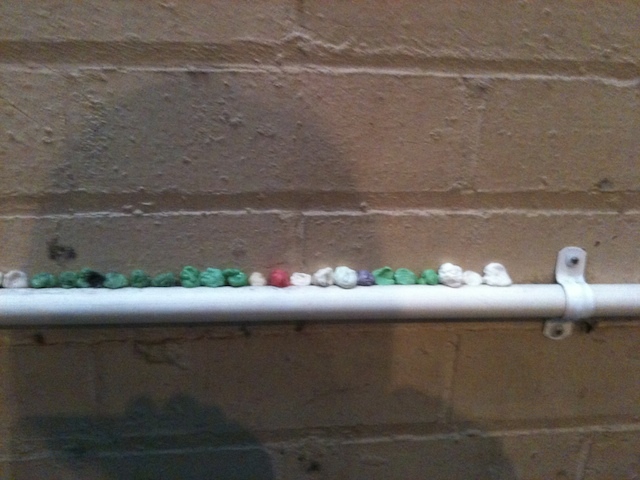 The gradually increasing line of variously coloured balls of gum has become a visual punctuation against the bland beige wood of the hoarding. It may not be sanitary, it may not be complicated; maybe the gum wads should indeed be in a bin. But I couldn’t help taking pleasure in the fact that someone (or several people) made the small aesthetic judgment to line them up rather than drop them randomly on the ground. It’s a small instance of aesthetic intervention in urban space, but a valuable one. And I’m grateful to the League of Resonance for sharing it with me on a date that made me pay attention to the intricacies of an area that could easily be dismissed as valueless, and for dedicating their time and energies over these several weeks to the project of understanding what makes a neighbourhood resonate, vibrate and hum. If you have been following the recent street art debacle in which Melbourne City Council ‘accidentally’ buffed one of Banksy’s rats in Hosier Lane in Melbourne, you might be interested in reading my account of this event, over on the excellent site Hyperallergic.